Raising kids, saving money, gardening, life--it's all here! I took on a challenge to make something new each month in the food canning arena. Food In Jars is a great resource for all kinds of fruit and pickle canning information and ideas for something new instead of the "tried and true." 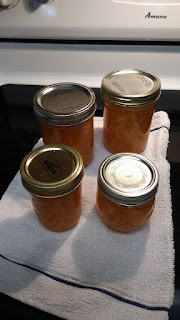 That said, I made a new recipe, but a favorite flavor: orange marmalade. I used my Instant Pot to speed the process along and it was very easy! No slicer here except my trusty knife, but cutting the oranges went quickly. Since my oranges were pretty sweet, I added sugar in a 1:1 ratio by weight to the fruit. I took bad advice from another recipe and put too much water in for the first cooking, so the marmalade's set was soft, but delicious nonetheless. My girls and I picked some more oranges from our friend's tree, so I'm ready to try a second batch! I'm a money-saving blogger living in Arizona. I have six lovely children and a delightful husband. I write about my life.